Description The BBC dramatization of Tolkien's celebrated fantasy. 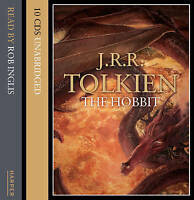 Author Biography J. R. R. Tolkien was born in 1892 in Bloemfontein, South Africa. From 1925-1959 he was an Oxford Professor, first of Anglo Saxon and then of English Language and Literature, but is best known as the author of the fantasy classic The Lord of the Rings. I am over the moon with this product. I had a copy on cassette years ago & have wanted to replace them for a while. My two children have just got in to Tolkien so these offered a great opportunity. They were delivered well ahead of schedule & are excellent value for money. Very happy, thank you. Superb adaptation by Brian Sibley which is faithful to the books.